The Brooklyn Infusion Center provides chemotherapy and acupuncture to Memorial Sloan Kettering patients in a convenient and comfortable setting in downtown Brooklyn. The facility is easily accessible by train, bus, and car. It features 12 private, state-of-the-art treatment areas, surrounding an indoor garden and patient library, with room for friends, family members, and caregivers. We also offer acupuncture appointments on a weekly basis. The modern waiting areas in our Brooklyn Infusion Center are designed to meet the needs of our patients and their families. Our 12 private treatment areas feature the most advanced technologies and comfortable seating. At the Brooklyn Infusion Center, you will spend time with our chemotherapy infusion nurses, who get you set up for chemo, look after you during treatment, and help you get ready when it’s time to go. You may also request to see one of our staff acupuncturists, who are on site each week. Learn about our care teams. 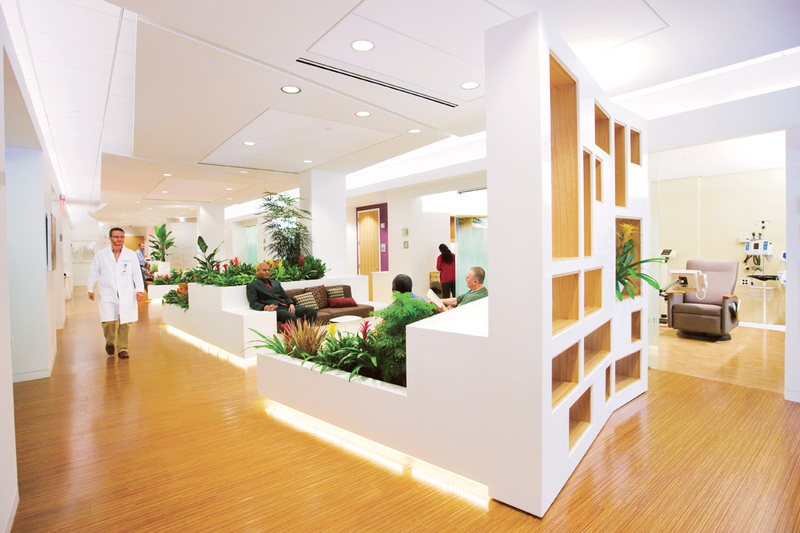 The indoor garden is a hallmark of the Brooklyn Infusion Center.